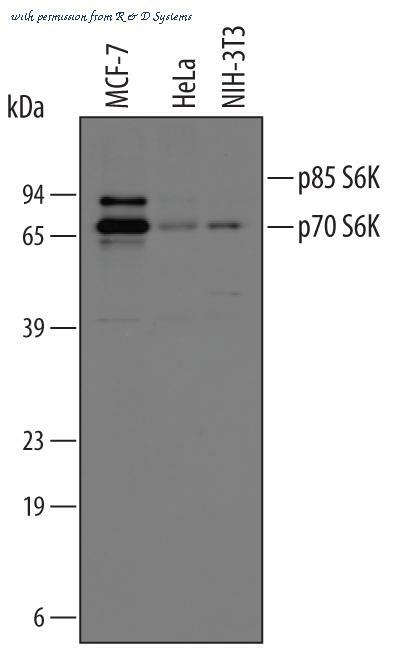 The p70S6K antibody from Proteintech is a rabbit polyclonal antibody to a recombinant protein of human p70S6K. This antibody recognizes human,mouse,rat antigen. 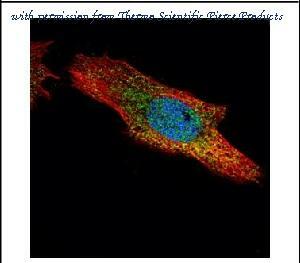 The p70S6K antibody has been validated for the following applications: ELISA, WB, IF, IP, FC, IHC analysis. 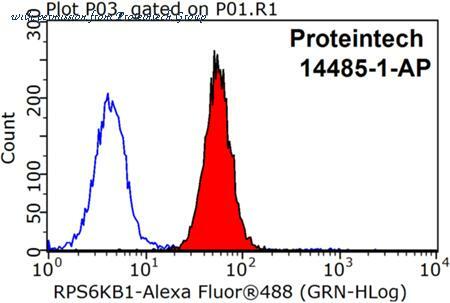 Detection of Human and Mouse Phospho-p70 S6 Kinase (T421/S424) by Western Blot. Western blot shows lysates of MCF-7 human breast cancer cell line untreated (-) or treated (+) with 100 ng/mL of Recombinant Human IGF-1 (Catalog # 291-G1 ) for 20 minutes and NIH-3T3 mouse embryonic fibroblast cell line untreated or treated with 100 ng/mL of Human PDGF (Catalog # 120-HD ) for 20 minutes. PVDF membrane was probed with 0.25 ╡g/mL of Rabbit Anti-Human/Mouse/Rat Phospho-p70 S6 Kinase (T421/S424) Antigen Affinity-purified Polyclonal Antibody (Catalog # AF8965), followed by HRP-conjugated Anti-Rabbit IgG Secondary Antibody (Catalog # HAF008 ). 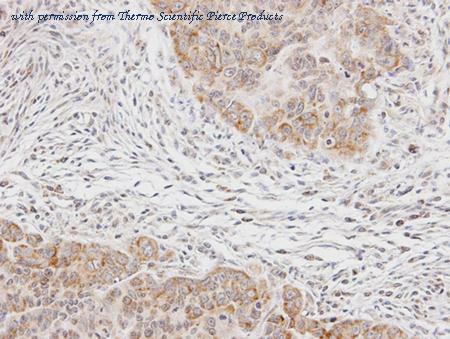 Specific bands were detected for Phospho-p70 S6 Kinase (T421/S424) at approximately 70 and 85 kDa (as indicated). This experiment was conducted under reducing conditions and using Immunoblot Buffer Group 1 . 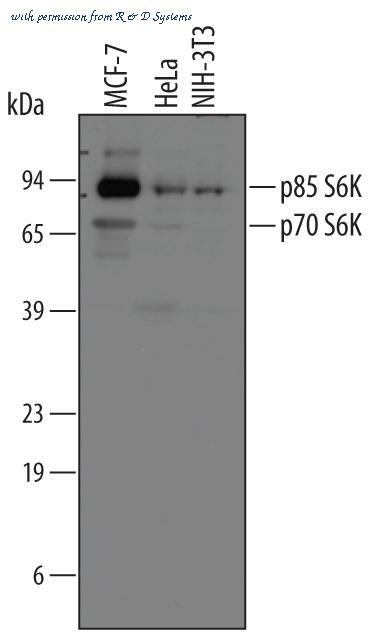 Detection of Human and Mouse p70 S6 Kinase by Western Blot. Western blot shows lysates of MCF-7 human breast cancer cell line, HeLa human cervical epithelial carcinoma cell line, and NIH-3T3 mouse embryonic fibroblast cell line. 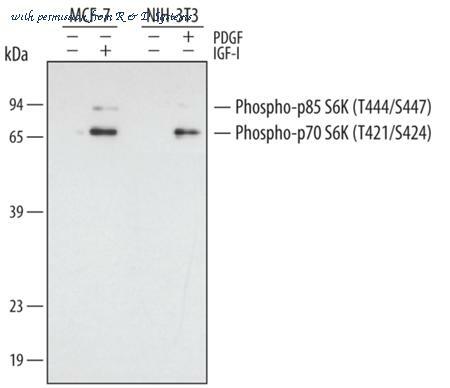 PVDF membrane was probed with 0.2 ╡g/mL of Rabbit Anti-Human/Mouse/Rat p70 S6 Kinase Antigen Affinity-purified Polyclonal Antibody (Catalog # AF8962) followed by HRP-conjugated Anti-Rabbit IgG Secondary Antibody (Catalog # HAF008 ). 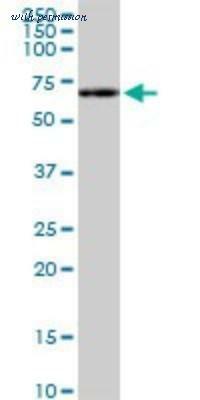 A specific band was detected for p70 S6 Kinase at approximately 70 and 90 kDa (as indicated). This experiment was conducted under reducing conditions and using Immunoblot Buffer Group 1 . Detection of Human and Mouse p70 S6 Kinase by Western Blot. Western blot shows lysates of MCF-7 human breast cancer cell line, HeLa human cervical epithelial carcinoma cell line, and NIH-3T3 mouse embryonic fibroblast cell line. PVDF membrane was probed with 1 ╡g/mL of Goat Anti-Human/Mouse/Rat p70 S6 Kinase Antigen Affinity-purified Polyclonal Antibody (Catalog # AF8964) followed by HRP-conjugated Anti-Goat IgG Secondary Antibody (Catalog # HAF109 ). Specific bands were detected for p70 S6 Kinase at approximately 70 and 85 kDa (as indicated). This experiment was conducted under reducing conditions and using Immunoblot Buffer Group 1 . 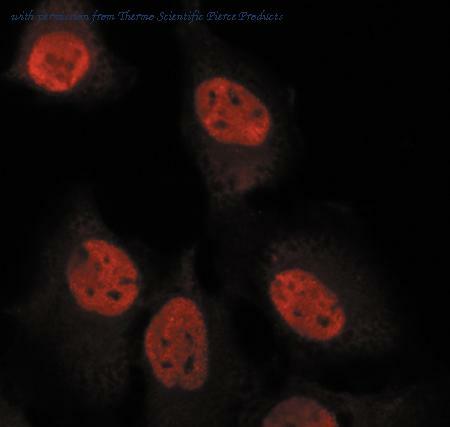 Confocal immunofluorescence analysis of paraformaldehyde-fixed HeLa using S6K (PA5-28597) antibody (Green) at 1:500 dilution. Alpha-tubulin filaments were labeled with MA1-25054 (Red) at 1:2000. 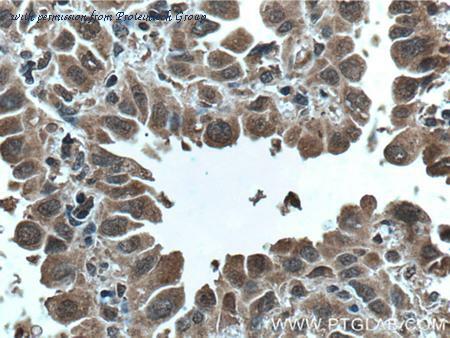 Immunohistochemical analysis of paraffin-embedded SW480 xenograft using S6K (PA5-28597) antibody at 1:100 dilution. 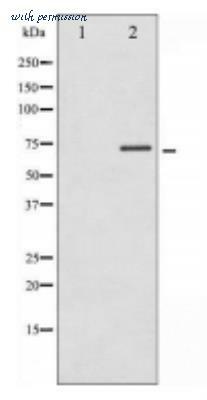 Western Blot analysis of S6K using anti-S6K Polyclonal Antibody (PA5-28597), in A431 Cell Lysate (30 ug of cell lysate) and at a dilution of 1:1000. 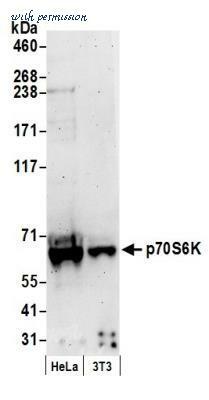 Western Blot: S6K Antibody [NB100-293] - Detection of Rat p70S6 Kinase by Western Blot. Sample: Lysate from rat L6 myoblast that were serum starved for 1.5 h (lane 1) or serum-deprived for 1 h and then treated with 20 ng/ml IGF-1 for 30 minutes (lane 2). 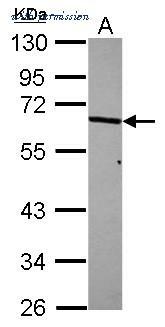 Antibody: Affinity purified rabbit anti-p70S6 kinase (NB100-293) used at 0.1 mcg/ml. Detection: Chemiluminescence. 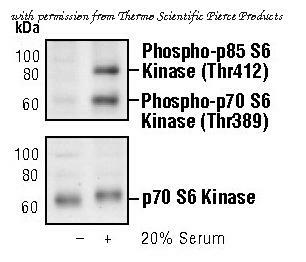 Western Blot: p70 S6 Kinase/S6K [p Thr389] Antibody [NB600-1049] - Analysis of p70 S6 Kinase phosphorylation expression in Insulin treated Jurkat whole cell lysates. The lane on the left is treated with the antigen-specific peptide. Western Blot: p70 S6 Kinase/S6K Antibody (4H4) [H00006198-M04] - Analysis of RPS6KB1 expression in Raw 264.7 (Cat # L024V1).